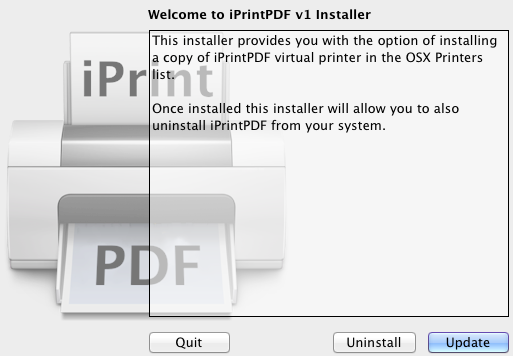 I have been looking at providing virtual printer support for AirPrint Activator for a long time but never got to it. Last night I had a come to Jesus moment where I figured a way to create a tiny tiny tiny virtual PDF printer. 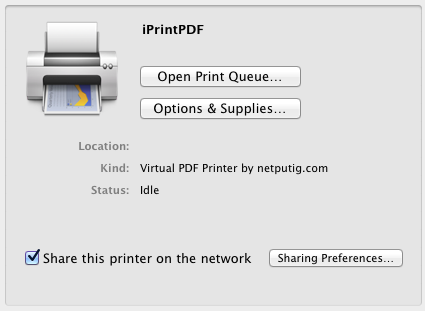 I have called it iPrintPDF. I think the name speak for what it does. This will add a virtual printer called, guess what, iPrintPDF to your printer list. You will simply need to share it so that AirPrint Activator can advertise it to your iDevice. All files sent to it will be made available in a folder called “iprintpdf” located in the current user’s “Documents” folder. There is no way to change the destination at the moment as this is just a couple of hours of work putting the stuff together. It is not available yet as it is not fully baked but let me know if this is of interest to you. A test version of the application can be found on the iPrintPDF page. You can discuss issues and suggestion for the application in the forum. This is not CUPS-PDF under the hood. It is rather leveraging the built in Apple PDF capabilities and exposing them as a cups printer. The nice thing is that you will also be able to print to if from other Macs on your network or from iDevices if you use AirPrint Activator. At the moment the installer stand at 208KB. This is very small and lightweight. This looks very intresting. Would be willing to test when it is ready.